TV journalist, baby boomer, and new septuagenarian senior citizen Diane Sawyer was born December 22, 1945 in the small town of Glasgow, Kentucky. She was raised in Louisville, Kentucky, where her father Erbon "Tom" Sawyer served as a judge and later as a Republican politician. Below, Good Morning America host Diane Sawyer is featured in a GMA farewell tribute. Diane Sawyer's entertainment career began during her last year of high school, when she represented Kentucky in the 1963 America's Junior Miss scholarship pageant and won it. She traveled for 3 years as America's Junior Miss, and later said the experience helped her to learn to think on her feet, with poise and grace. Below, a moment in time that captures the beauty and grace of a young Diane Sawyer, the morning after winning the 1963 America's Junior Miss Pageant. Diane Sawyer graduated with a BA from Wellesley College in 1967 and upon graduation, worked as a weather forecaster for a Louisville, Kentucky TV station. When her career as a broadcast journalist failed to materialize after moving to Washington, D.C. in 1970, she got a job as an assistant, writing press releases for the White House Deputy Press Secretary. Before long Diane Sawyer was drafting some of the public statements for then-President Richard Nixon, and from there became an admin assistant to the White House Press Secretary Ron Ziegler. By 1974 when Richard Nixon was faced with the increasing likelihood of being impeached, Diane Sawyer had become an assistant on Nixon's staff. Within a couple of years after President Nixon resigned and moved to California, Sawyer left her White House staff assistant role and moved to California to help Nixon with his memoirs RN: The Memoirs of Richard Nixon (1978). Below, Diane Sawyer and other news anchors are featured in a CBS News promotion spot from 1987. Diane Sawyer began to realize her earlier dreams of becoming a broadcast journalist when she moved back to Washington, D.C. in 1978 and began working as a reporter for CBS News, segueing to becoming the CBS Morning News co-anchor from 1981 to 1984. By 1984 she had made her way to 60 Minutes, the venerable CBS News investigative journalism television show. For the next 30 years, Diane Sawyer worked steadily on both prime-time (Primetime Live, 20/20, ABC World News) and morning (Good Morning America) news magazine-format television shows for CBS and later ABC. 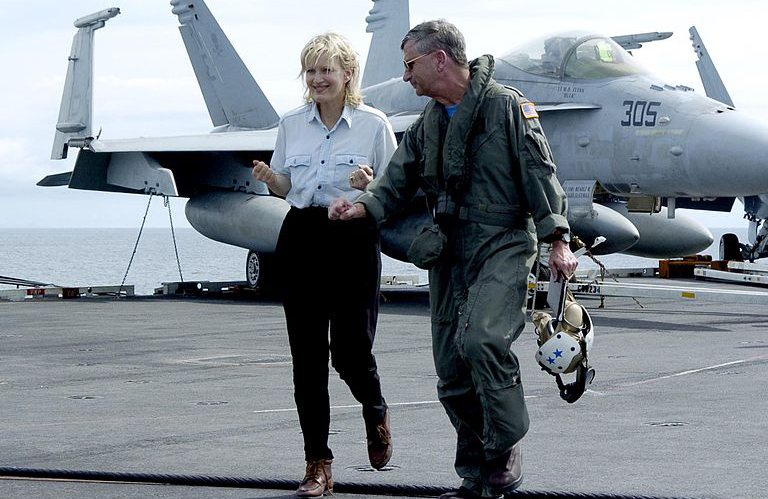 Below, Diane Sawyer in 2005 with Rear Admiral Doug Crowder on the USS Abraham Lincoln flight deck somewhere in the Indian Ocean. Since becoming a senior citizen in 2010, Diane Sawyer has completed her run (from 2009-2014) as ABC World News anchor. She left the role in September 2014, 2 months before her husband of 26 years, producer and director Mike Nichols (aged 83), died of a heart attack. Below, presenters Elaine May, Meryl Streep & Candice Bergen, along with Mike Nichols and Diane Sawyer, are shown during the presentation of the 2003 Kennedy Center Honors for Nichols. In 2011, Sawyer ran a series on ABC World News about the families of people who are aging, and the care and issues surrounding older adult relatives, for the baby boomer generation. A senior herself, Sawyer began working with celebrity fitness trainer Jim Karas that same year. She told Joann of How Celebrities Lose Weight that she had pledged her viewers to get in shape. Even though she was a senior citizen, Sawyer ended up losing 3 inches on her arms and more than 20 pounds in 3 months on a healthy weight loss plan, by cutting back daily calories and spending more time on resistance fitness training exercises vs cardio. Below, Diane Sawyer gives a tour and overview of World News. Since retiring from ABC World News, Diane Sawyer has done high profile interviews, including her recent award-winning "Bruce Jenner: The Interview". This was Sawyer's 4th win of the DuPont Award (journalism's equivalent of the Pulitzer Prize). She has also won a Daytime Emmy Award (2000) for excellence in morning programming, and in 1997 made it into the Television Hall of Fame for her contributions to television journalism. Happy 70th Birthday, Diane Sawyer!